In an effort to help prevent food borne illness and death, leading online cooking resource AmazingRibs.com announced today the 2018 AmazingRibs.com Pitmaster Awards for Best Value Cooking Thermometers for both indoors and outdoors. A good digital thermometer is the single most important kitchen tool because it can save lives. "A good digital thermometer is the single most important kitchen tool because it can save lives," says the site's electrical engineer, Bill McGrath. He cites a 2014 Consumer Reports article that found 90% of all chicken tested contained pathogenic bacteria and half of them had antibiotic resistant strains. They can be killed by cooking the meat to the proper temperature. Contrary to the popular myth that the safety of chicken can be determined by the color of its juices, Consumer Reports noted that "It's vital that you check [meat] using a meat thermometer." In addition, no one wants to ruin expensive meats by overcooking them. A perfectly cooked steak can quickly become shoe leather if the internal temperature isn’t monitored. And no, poking it with a thermometer will not dry it out! This year’s winners were selected from more than 150 reviews that have been conducted exclusively for AmazingRibs.com by McGrath. He uses precision equipment and real world scenarios to test and evaluate based on (1) accuracy, (2) speed, (3) features, (4) construction quality, and (5) value. Suppliers are never charged to have products reviewed and the website purchases almost all the products it tests. Here are the 2018 Pitmaster Award winners in four categories and Manufacturer Suggested Retail Prices. Click the links for McGrath's detailed reviews and pictures as well as links to suppliers. Dial thermometers often take 30 seconds for a reading and not accurate. In contrast, today’s digital hand-held and wired probe thermometers provide precise temperatures within seconds. For large roasts and cuts of meat that cook over long periods of time, thermometers with a probe on a wire and a meter than can sit outside the oven or grill are essential. Wireless remote-monitored thermometers allow the user to accurately track temperatures with a meter in their pocket while tending to other tasks such as cutting the lawn or watching the game. Thermostatic controllers can even make your charcoal or wood fired smoker or grill function more like your indoor home oven. These sophisticated digital thermostats help maintain consistent temperatures within the cooker, a critical component when cooking slowly at low temperatures for an extended period of time. Infrared laser guns are designed to read the temperature of a hot surface like a griddle, a pizza stone, or a frying pan. They cannot accurately read meat temp nor can they measure the temp of a grate or the air inside a grill. You point the gun at a surface like a pizza stone, pull the trigger, and it puts a laser beam on the target. If you are serious about pizza on the grill, you want one. 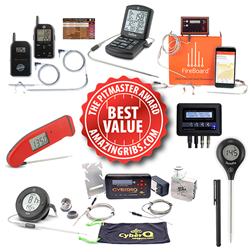 The website also has a full-time grill and smoker tester and tests and reviews many other cooking products. For more information please visit: https://amazingribs.com/ratings-reviews-and-buying-guides. AmazingRibs.com is by far the leading resource for BBQ and grilling info with more than 2,000 pages of product reviews, recipes, cooking techniques, science-based mythbusting, tips, tricks, and community. In 2017, the site enjoyed more than 37 million pageviews, making it one of the most popular food sites of any kind. It boasts a team of 20 authorities and tastemakers, all devoted to educating backyard cooks around the globe. They don’t do sponsored articles, paid articles, or accept junkets. The site’s advertising is sold by third party ad networks.